di sertakan sinopsis Twilight Breaking Dawn ihsan wikipedia. Breaking Dawn is the fourth and final novel in the The Twilight Saga by American author Stephenie Meyer. Divided into three parts, the first and third sections are written from Bella Swan's perspective and the second is written from the perspective of Jacob Black. 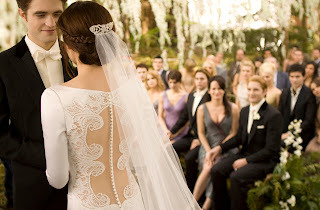 The novel directly follows the events of the previous novel, Eclipse, as Bella and Edward Cullen get married, leaving behind a heartbroken Jacob. When Bella faces an unexpected situation, she does what it takes to undergo the ultimate transformation and fight the final battle to save her love. tq yang tuk yg ni pulak.. mlm kang layan dgn anak2.